Caribou, Maine celebrated the first day of spring by setting a new snowfall record overnight during a strong winter snowstorm. The National Weather Service reported the snowfall total at 183 inches as of last night with more snow and a blizzard warning today. For the divisionally challenged, 183 inches is 15+ feet of snow. The previous record of of 181.2 inches of snow was set in 1955. As if this wasn't enough, yesterday Caribou set a record for the amount of snow received in one day, 10.6 inches. This breaks the previous record of 9.5 inches set in 1971. 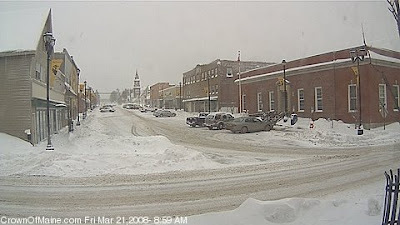 I used a photo from the live webcam at the Crown of Maine website. Click for updated photos of downtown Caribou. More webcam images of the Aroostook area are available through the weather site Wunderground. While I enjoyed the few years I lived in Aroostook County, I don't miss those winters at all --I'm happy with my zone 5 climate, thank-you. On the map, you'll see Caribou in very far northern Maine. I used to live in Presque Isle, just a few miles south of Caribou. I now live about a 4 1/2 hour drive south of there, not too far from Brunswick. I am lucky, I know it and count my blessings frequently. I live in a walkable small town and have made great friends there, yet my town is rural enough that I can have poultry in my backyard and a big garden. To top it off, I'm just 40 minutes from Popham Beach, one of the most beautiful beaches on earth, and I cannot begin to count the lakes, ponds and rivers nearby which beckon my kayak. And I don't have 15 feet of snow in my backyard.